Keep the lights "ON" when you need them the most. 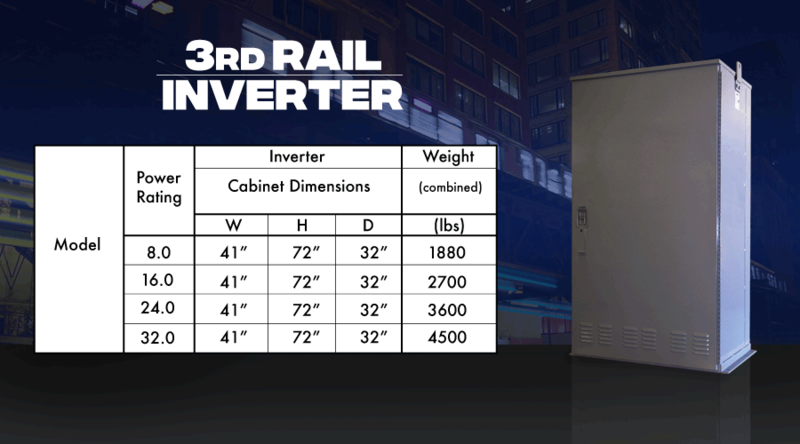 • 600 VDC 3rd Rail Inverter outdoor or indoor operation. • 1ø or 3ø AC outputs. • Pure sine wave output for all types of loads. • Withstands 3000 volt impulse without damage. NFPA 101, NFPA 70, NEC and OSHA. • Model available 2000 VDC continuous operation. We recommend that you download Firefox Browser for better viewing of our website.